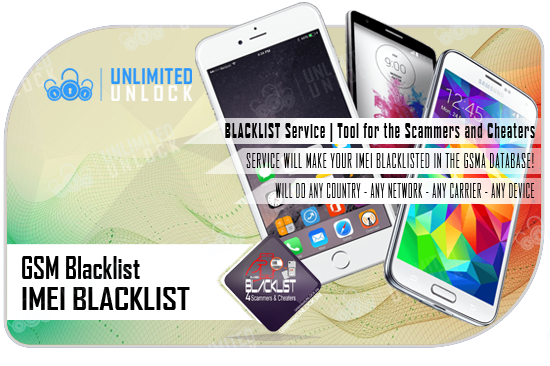 Exclusively for UnlimitedUNLOCK server we have ADDED the service|tool GSM BLACKLIST - [IMEI BLACKLIST] Service is working fine and delivery time is delivering in less time [Monday to Friday] and support absolutely Any Country, Any, Network, Any Manufacture, Any Model ! This is a new exclusive service from UnlimitedUNLOCK Server, This service is a BLACKLIST Service | Tool for the Scammers and Cheaters - who do charge backs and/or disputes after unlock is completed "done" ! THIS SERVICE WILL MAKE YOUR IMEI BLACKLISTED IN THE GSMA DATABASE ! Our system will return the unlock code status as "BLACKLISTED" ! It can take 24-72 Hours to appear blacklisted in the GSMA Database.